Background: Periodontitis and stress are among the areas of increasing interest over the past two decades. Early detection of these diseases plays a crucial role in successful therapy. Cortisol is a protein which was found to be consistently associated with both. Aim: The present study was aimed to evaluate saliva cortisol levels (SCLs) in chronic periodontitis (CP) patients with and without stress. Materials and Methods: In this cross-sectional study, saliva samples were collected and cortisol levels were determined using ELISA method in 92 participants. The participants were divided into four groups based on periodontal condition (number of teeth present, plaque index (PI), bleeding on probing (BOP), probing pocket depth, and clinical attachment level) and stress levels into Group 1 (no periodontitis and no stress), Group 2 (with periodontitis and no stress), Group 3 (without periodontitis and with stress), and Group 4 (with periodontitis and stress). Results: Overall, 92 adult participants (41 males and 51 females) were included in the study. Participants with stress and periodontitis have high mean SCL when compared to other groups (Group 1: 15.01 ± 2.62, Group 2: 31.92 ± 6.80, Group 3: 34.47 ± 13.47, and Group 4: 60.13 ± 6.68). Group I shows a significant negative correlation of cortisol to BOP, stress to PI, and stress to cortisol level, whereas there is a positive correlation of SCL to PD in Group 4 which is not statistically significant. Conclusion: SCL showed difference among the groups. SCL were associated with both CP and psychological stress. Increase in inflammation and stress levels enhances the SCL. Chronic periodontitis (CP) is a multifactorial disease, with a complex interaction between microbial infection and host response in which microbial dental biofilms are considered as the main etiological agents for initiation of the inflammation. Disease progression and its severity are the result of interaction between host response and exposure to systemic and environmental factors. 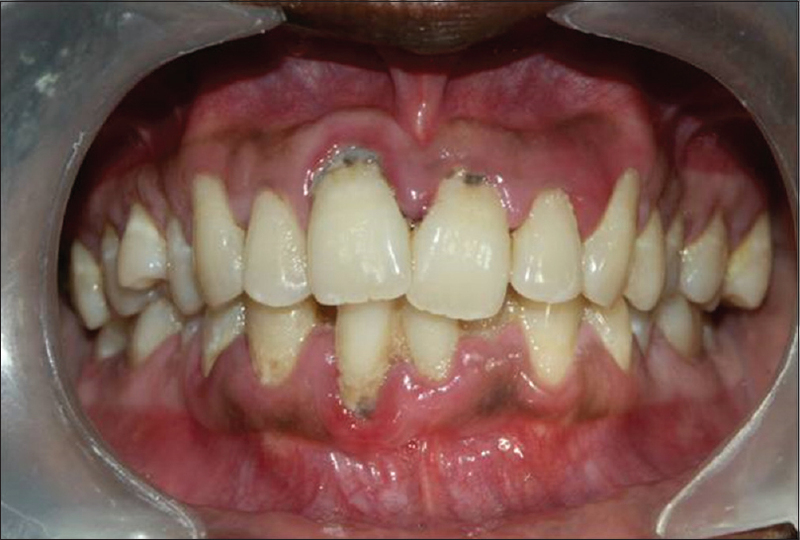 Possible risks and susceptibilities of periodontitis are systemic diseases, genetic polymorphisms, socioeconomic status, tobacco smoking, and psychological stress. Stress, a term continually being redefined in the scientific study of disease and illness, is nevertheless a confirmed and important factor in the etiology and maintenance of many inflammatory diseases, including periodontal disease. The literature relating stress to periodontal disease focuses on psychosocial stressors and their influences on susceptibility to gingival infection and/or the inflammatory aspects of periodontal disease. Reviews have sought the stress phenomenology into evidence-based models linking stress with periodontal disease., Stressors from physical and psychological domains serve as risk factors for periodontal disease. The hypothalamic–pituitary–adrenal axis (HPA axis) is known as the “stress system” of the body and regulates the levels of cortisol and other stress-related hormones. Activation of the HPA axis is a part of the normal physiological response to inflammatory, physical, and emotional loads and is designed to protect the host and to maintain homeostasis in a challenging environment. In response to stress, the paraventricular nucleus of the hypothalamus releases corticotrophin-releasing hormone, which acts on the pituitary gland. In response, the pituitary gland releases adrenocorticotrophic hormone, which stimulates the adrenal cortex release of cortisol into the blood. During normal situations, a certain level of cortisol is maintained in the blood by the suprachiasmatic nucleus or the hypothalamus, the body clock that rhythmically activates the HPA axis and thus controls the release of cortisol. Cortisol, one of the most important glucocorticoids, is a hormone produced in the adrenal cortex. It has major anti-inflammatory and immunosuppressive properties, inhibiting the formation of lymphocytes and inducing lymphatic tissue hyperplasia. As antibody production is simultaneously inhibited, there is a marked decline in humoral immune defense. Cortisol is moreover antiphlogistic due to its inhibitory effect on the proliferation of fibroblasts in the inflammatory granulation tissue. The synthesis of some pro-inflammatory cytokines will be suppressed. As a consequence, immune defense is decreased due to cortisol secretion, thus effecting homeostasis. Historically, gingival crevicular fluid (which is a serum transudate), serum, and more recently saliva are used as potential sources for analysis of biomarkers in periodontitis as well as in stress. Studies , have found that cortisol in saliva (1) represents “free” biologically active cortisol, (2) is unaffected by salivary flow rate, (3) consistently and reliably reflects free serum cortisol and HPA axis reactivity, and (4) is also a more practical assessment tool than venipuncture in stress research due to its potential to elicit spurious increases in cortisol secretion reflecting a “hyperstress” component. Hence, in the present study, an attempt was made to evaluate the association of stress, CP, and salivary cortisol. A clinico-biochemical study was conducted by the Department of Periodontics, Narayana Dental College and Hospital, with the help of Department of Psychiatry, Narayana Medical College and Hospital, Nellore, AP, India, to assess the association of stress, salivary cortisol, and CP. The study has been conducted after receiving approval from the Institutional Ethical Committee. The trial has been registered with Clinical Trials Registry-India (CTRI/2016/12/007616). Inclusion criteria are age ≥30 years (30–60 years) with >20 teeth and participants without systemic diseases and medications, and who had not received any periodontal treatment in the past 6 months. Pregnant and lactating women were excluded from the study. A total of 500 patients have been screened for a period of 6 months of which only 136 members were included in the study based on inclusion and exclusion criteria. The included members were divided into four groups based on the oral, periodontal examination and stress questionnaire: Group 1 (no stress and no periodontitis [Figure 1]) – 37 members, Group 2 (CP and no stress) [Figure 2] – 34 members, Group 3 (stress and no periodontitis) – 23 members, and Group 4 (stress and periodontitis) – 23 members. Through simple randomization, 23 members have selected from each group and saliva has been collected for the estimation of salivary cortisol levels [Figure 3]. Nature of the study was explained to all the participants and written informed consent was obtained. Periodontal examination and stress assessment with questionnaire  have been performed for all the participants. To assess stress in all patients, Depression, Anxiety, and Stress Scale-21 items (DASS-21) was used. This DASS-21 is a set of three self-report scales designed to measure the emotional states of depression, anxiety, and stress. Each of the three DASS-21 scales contains 7 items, divided into subscales with similar content. The depression scale assesses dysphoria, hopelessness, devaluation of life, self-deprecation, lack of interest/involvement, anhedonia, and inertia. The anxiety scale assesses autonomic arousal, skeletal muscle effects, situational anxiety, and subjective experience of anxious affect. The stress scale is sensitive to levels of chronic nonspecific arousal. It assesses difficulty relaxing, nervous arousal, and being easily upset/agitated, irritable/over-reactive, and impatient. Scores for depression, anxiety, and stress are calculated by summing the scores for the relevant items. 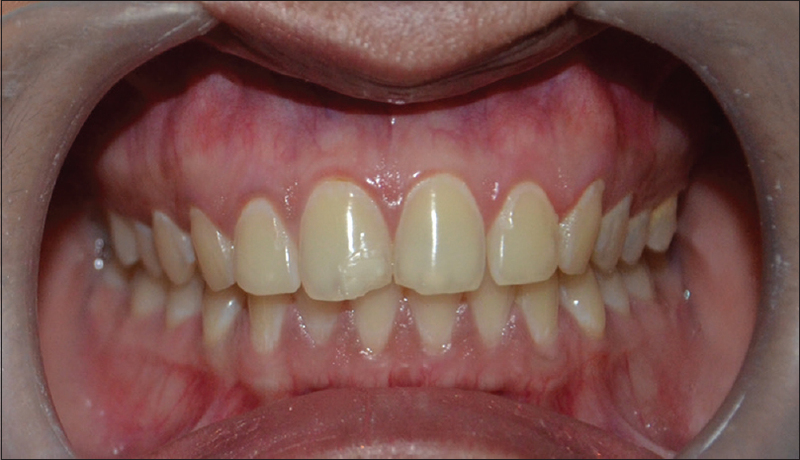 Based on the presence or absence of gingival inflammation, loss of attachment in excess of 4 mm, probing depth in excess of ≥5 mm at 3–4 sites in more than 4 teeth in each quadrant, and stress levels of the participants have been categorized into 4 groups. The data were computerized using Microsoft Excel sheet. All the clinical and biochemical values were subjected for statistical analysis using software program IBM SPSS version 21 (Armonk, NY: IBM Corp). Basic descriptions were presented in the form of mean and standard deviation. Shapiro-Wilk normality test results showed that all parameters follow the normal distribution. Therefore, parametric methods were applied for the analysis of the data. Multiple group comparisons were done using analysis of variance and Tukey's post hoc test was used for further pairwise comparisons. The level of significance was set at P < 0.05 for all tests. [Table 1] shows mean and standard deviation of age, gender, and brushing habits of participants in different groups. Mean and standard deviation of various parameters in different groups were shown in [Table 2]. There is a gradual increase (Group 1: 15.01 ± 2.62, Group 2: 31.92 ± 6.80, Group 3: 34.47 ± 13.47, and Group 4: 60.13 ± 6.68) in mean cortisol level from Group 1 to Group 4. This shows that patients with stress and periodontitis have high mean saliva cortisol levels (SCLs). Comparison of salivary cortisol levels with various parameters within the groups was done by applying Pearson's correlation test as shown in [Table 3]. Group I shows a significant negative correlation of cortisol to bleeding on probing (BOP) (−0.560, P = 0.005) and there is negative correlation of cortisol to PD (−0.122, P = 0.569) which is not significant. Similarly, there is negative correlation between cortisol and plaque index (PI) (−0.106, P = 0.631) and cortisol to PD (−0.076, P = 0.730) in Group 2 which are not significant. In Group 3, there is an insignificant negative correlation between cortisol and PI (−0.135, P = 0.539) and BOP (−0.013, P = 0.952). Comparison of stress levels with cortisol and other clinical parameters were shown in [Table 3]. There is a significant negative correlation between stress and PI (−0.608, P = 0.002) and stress and cortisol levels (0.492, P = 0.017) in Group 1. In Group 2, there is a negative correlation between stress and PI (−0.160, P = 0.467) and PD (−0.086, P = 0.697) and in Group 3 between stress to BOP (−0.192, P = 0.389) and cortisol (−0.330, P = 0.124) which were not significant. In Group 4 there is an insignificant correlation between stress and BOP (−0.054, P = 0.806), PD (−0.162, P = 0.460), and cortisol levels (−0.207, P = 0.344). There is a positive correlation between cortisol levels and PI (0.395, P = 0.062), BOP (0.518, P = 0.11), and PD (0.309, P = 0.151), and similarly, there is a positive correlation between stress and PI (0.115, P = 0.603), which were not significant as shown in [Table 3]. In the present study, PI and BOP showed a significant difference among the groups with more mean values in Group IV. On comparison of Group II and III, the mean values of PI and BOP are more in Group II compared with Group III and least in Group I in similar to Mannem and Chava. Hilgert et al., 2006, observed that the reproducibility of the intra-examiner visual PI measures values was considered excellent, while the inter-examiner visual PI values and intra-and inter-examiner gingival bleeding index were good. However, Goyal et al., 2011, observed that plaque levels are positively correlated with stress and cortisol. It was noted that stress factor has an important bearing on plaque and periodontal disease in accordance with Rohini et al., 2015. Cakmak et al., 2014, observed statistically significant differences in mean and median values of the periodontal clinical parameters, i.e. PI, BOP, gingival index, PD, and clinical attachment level (CAL). Similarly, Croucher et al., 1997, found that psychosocial factors that are represented by impact of life events, employment and marital status, as well as dental plaque levels and tobacco smoking cluster together as important correlates of periodontitis and these factors may be important determinants of periodontitis. Deinzer et al., 2005, discussed that plaque is a valid indicator of oral hygiene behavior even under academic stress conditions. Stress increases the quantity of plaque as a consequence of its adverse influence on oral hygiene practices. These data strongly support the notion discussed by Genco et al., 1999, that stress effects on periodontal health might be mediated, at least in part, by stress-induced neglect of oral hygiene for further potential mediators which might in part act synergistically to stress-related plaque accumulation. In the present study, statistical significant difference was noticed among Groups I and II, I and IV, II and III, II and IV, and III and IV with more mean PD and CAL in Group IV followed by Group II then III and least in Group I. No statistical significance was found between Group I and III. According to Hilgert et al., 2006, good reproducibility was reported for both PD and CAL measures. Hypercortisolemia was associated independently with the extent and severity of periodontitis as defined by PD and CAL. In a prospective study by Freeman and Goss, 1993, stress due to physical health was related to an increase in pocket depth. On the other hand, Linden et al., 1996, found no evidence of an association between self-assessed physical health and periodontal disease progression. Their study was a longitudinal though the sample size was relatively small. In the present study, much relation was not observed with brushing frequency between CP and stress group. Similarly, in a cross-sectional study by Rosania et al., 2009, the investigators showed that participants, who experienced more stressors, had more CAL and PD and also found that there was a negative correlation between total stress scores and brushing frequency. On comparison of stress among the groups, statistical significance was found between Groups I and III, I and IV, II and III, and II and IV with more mean stress scores in Group III. No statistical significance was found between Groups I and II and III and IV. With respect to salivary cortisol levels, statistical significance was found between Groups I and II, I and III, I and IV, II and IV, and III and IV with more mean values in Group IV attributed to superimposition of the both psychological stress and CP. In accordance to our study, Genco et al., 1999, in a subsample of individuals with and without periodontitis, the mean levels of salivary cortisol were higher in a group of CP. In the present study, more amounts of periodontal destruction and disease severity were observed in CP associated with stress, showing increased PD, CAL, and disease activity. This may be attributed to superimposition of the periodontitis with stress and cortisol, considered as one of the risk factors for periodontitis. According to the present study, cortisol in saliva was detected even in clinically healthy individuals; however, it was relatively very minimal compared to the diseased groups. This may be because healthy oral cavity also harbors various bacteria that may cause low-grade inflammatory response in the periodontal tissues, indicating that cortisol in clinically healthy tissues may facilitate controlled chemotaxis, which is required for immune regulation. On correlation of the clinical parameters, PI and BOP showed high significance among all the groups, indicating that increased SCL is associated with periodontal destruction. Within the limits of the study, cortisol was associated with both CP and psychological stress. The levels of this protein are higher in case of CP associated with stress than in CP or stress alone. Increase in inflammation and stress enhances the salivary cortisol levels. I would like to acknowledge the participants of the study for their kind cooperation. Refulio Z, Rocafuerte M, de la Rosa M, Mendoza G, Chambrone L. Association among stress, salivary cortisol levels, and chronic periodontitis. J Periodontal Implant Sci 2013;43:96-100. Genco RJ. Current view of risk factors for periodontal diseases. J Periodontol 1996;67:1041-9. Genco RJ, Ho AW, Kopman J, Grossi SG, Dunford RG, Tedesco LA, et al. Models to evaluate the role of stress in periodontal disease. Ann Periodontol 1998;3:288-302. Hagan P, Poole S, Bristow AF. Immunosuppressive activity of corticotrophin-releasing factor. Inhibition of interleukin-1 and interleukin-6 production by human mononuclear cells. Biochem J 1992;281(Pt 1):251-4. Ardila CM, Guzmán IC. Association of Porphyromonas gingivalis with high levels of stress-induced hormone cortisol in chronic periodontitis patients. J Investig Clin Dent 2016;7:361-7. Rai B, Kaur J, Anand SC. Possible relationship between periodontitis and dementia in a North Indian old age population: A pilot study. Gerodontology 2012;29:e200-5. Nejtek VA. High and low emotion events influence emotional stress perceptions and are associated with salivary cortisol response changes in a consecutive stress paradigm. Psychoneuroendocrinology 2002;27:337-52. Lovibond SH, Lovibond PF. Manual for the Depression Anxiety & Stress Scales. 2nd ed. Sydney: Psychology Foundation; 1995. Mannem S, Chava VK. The effect of stress on periodontitis: A clinicobiochemical study. J Indian Soc Periodontol 2012;16:365-9. Goyal S, Jajoo S, Nagappa G, Rao G. Estimation of relationship between psychosocial stress and periodontal status using serum cortisol level: A clinico-biochemical study. Indian J Dent Res 2011;22:6-9. Rohini G, Kalaivani S, Kumar V, Rajasekar SA, Tuckaram J, Pandey V, et al. Estimation and comparison of serum cortisol levels in periodontally diseased patients and periodontally healthy individuals: A clinical-biochemical study. J Pharm Bioallied Sci 2015;7:S457-60. Cakmak O, Alkan BA, Ozsoy S, Sen A, Abdulrezzak U. Association of gingival crevicular fluid cortisol/dehydroepiandrosterone levels with periodontal status. J Periodontol 2014;85:e287-94. Deinzer R, Granrath N, Spahl M, Linz S, Waschul B, Herforth A, et al. Stress, oral health behaviour and clinical outcome. Br J Health Psychol 2005;10:269-83. Freeman R, Goss S. Stress measures as predictors of periodontal disease – A preliminary communication. Community Dent Oral Epidemiol 1993;21:176-7. Rosania AE, Low KG, McCormick CM, Rosania DA. Stress, depression, cortisol, and periodontal disease. J Periodontol 2009;80:260-6.